The Denver Post is bringing back its paywall this week, but this time it means business. “Time to put a ring on it,” as editorial page editor Chuck Plunkett put it in an opinion piece about changes coming to TheDenver Post this year. Colorado’s largest newspaper raised a paywall in 2013, but took it down during its trial coverage of the Aurora theater shooter in 2015, , according to Columbia Journalism Review. 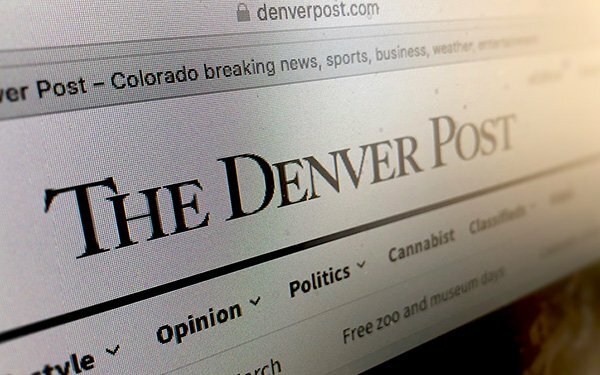 Now, readers without a print subscription will have to pay $11.99 a month to access The Denver Post’s online content, “which is way, way, way less than you’d pay to support even the mildest of coffee habits,” Plunkett wrote. The Denver Post tested the paywall for a few weeks, asking those with ad blockers to subscribe (to either print or digital packages) or turn off their blocker, Plunkett wrote. Online readers who hit “a certain per-month threshold — soon to be ratcheted down to a handful of views,” will now be asked to purchase a digital subscription. Existing print subscribers can log in and do not need to pay extra to access The Denver Post's online content. The new paywall comes during a transitional time for the newspaper. A round of layoffs hit The Denver Post during the holidays, which resulted in the departure of longtime managing editor Linda Shapley. It will soon move its offices to a nearby county to cut costs. Last week, The Denver Post’s CEO and publisher, Mac Tully, abruptly announced he was leaving the company at the end of this month. “I’m not ready for retirement yet, but after 40 years in the industry, I’m ready for something a little less stressful,” Tully wrote in a memo to staff. “But the reality is that behemoths like Google and Facebook, which we helped create and continue to sustain with our content, take practically all the money available for digital ads,” he continued. The Denver Post is owned by Digital First Media, which is controlled by the New York City hedge fund Alden Global Capital. The newspaper's editor-in-chief Lee Ann Colacioppo told CJR there is no guarantee from Digital First Media that revenue generated by the new paywall will deter future newsroom cuts, but she is hopeful. The Denver Post is not alone in hoping a paywall will help make up for revenue lost to Facebook and Google. The Atlantic and Wired launched metered paywalls this month, and The New York Times cut in half the number of articles readers can access for free last month.